2016 Miss Precious Gem and her court (l. to r.). Airen J. Young, Kylan A. Campbell, Katelyn A. Reynold (2nd Runner Up), 2016 Miss Precious Gem Christina A. Manning, Taylor I. 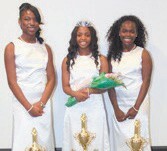 Brown (1st Runner Up), Trinity L. Perry, & K’yla A. Hankerson. Moving All Races To Higher Achievement, Incorporated crowned Christine A. Manning “2016 Miss Precious Gem” on Saturday, June 11th, 2016 at their Junior Debutante Cotillion held in the Student Union Ballroom at Savannah State University. Christina A. Manning, the daughter of Telethia Manning Wallace and Ronald Cook Jr., sang a memorable version of “I Was Here”. She is a rising 9th grade High Honor Roll student at Calvary Day School, who aspires to become a plastic surgeon. She attends Jonesville Baptist Church and enjoys reading, singing, cheerleading, playing basketball and soccer. Scott Brown, first runner up; Katelyn A. Reynolds, the daughter of Anthony E. and April Reynolds, second runner up; Kylan A. Campbell, K’yla A. Hankerson, Trinity L. Perry, and Airen J. Young. This year’s theme, “Elegance in Bloom”, was showcased as the Precious Gems informally introduced themselves and their aspirations, performed piano solos, vocal solos, self-written poem and a spiritually uplifting dance. Mrs. Eudora Allen then formally introduced them as they were escorted into the ballroom in their full-length white gowns. Miss Manning was escorted by Michael Leon Cross, Jr., a family friend. The Precious Gem mentoring program provides training for social, educational and cultural growth for middle school age young ladies. 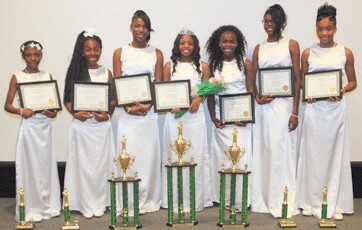 The Miss Precious Gem Junior Debutante Cotillion allows Moving All Races To Higher Achievement (M.A.R.T.H.A.) Inc., the 501 (c)(3) nonprofit of Gamma Sigma Omega chapter of Alpha Kappa Alpha Sorority, Incorporated to continue to provide scholarships and charitable contributions to programs and services that assist in the growth and development of the communities, families and children within the Savannah-Chatham area. MARTHA is under the leadership of S. Renee Grant, President. The Cotillion was co-hosted by the Gamma Upsilon Chapter of Alpha Kappa Alpha Sorority at Savannah State University.